After spending well more than a year building my last project, it is pretty cool to be getting underway on a new one. 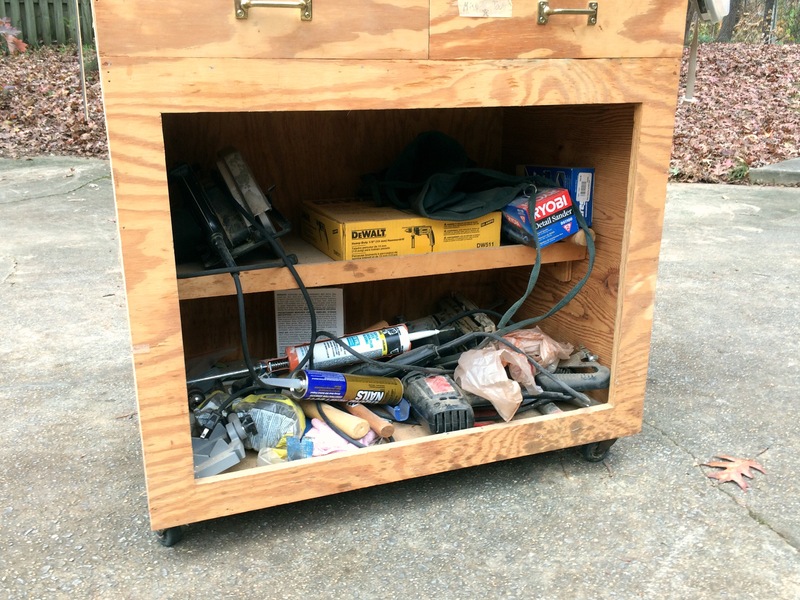 Up next is the construction of a new tool cabinet. Even since my last blog post, the design has evolved. So far, I have designed just the face frame with the drawer faces in place. The case itself has never been put down on paper, or in SketchUp; it’s been bouncing around in my head for weeks. My old tool cabinet. Almost an antique. The top is home to a small nail/screw cabinet and various other things. The lower cabinet has become an unorganized mess. 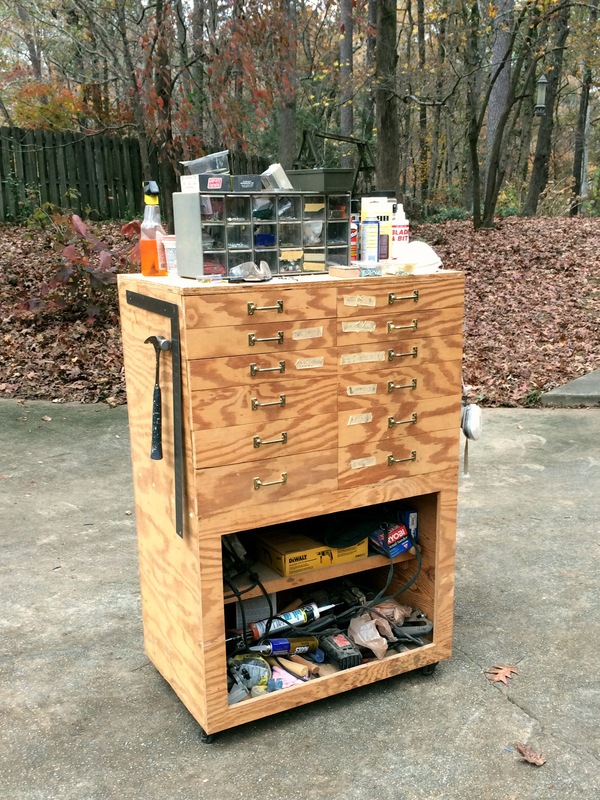 This cabinet was built based on a plan in Woodsmith magazine from long ago (I think). I have searched online for the issue which contains the plan, but have not been able to find it. 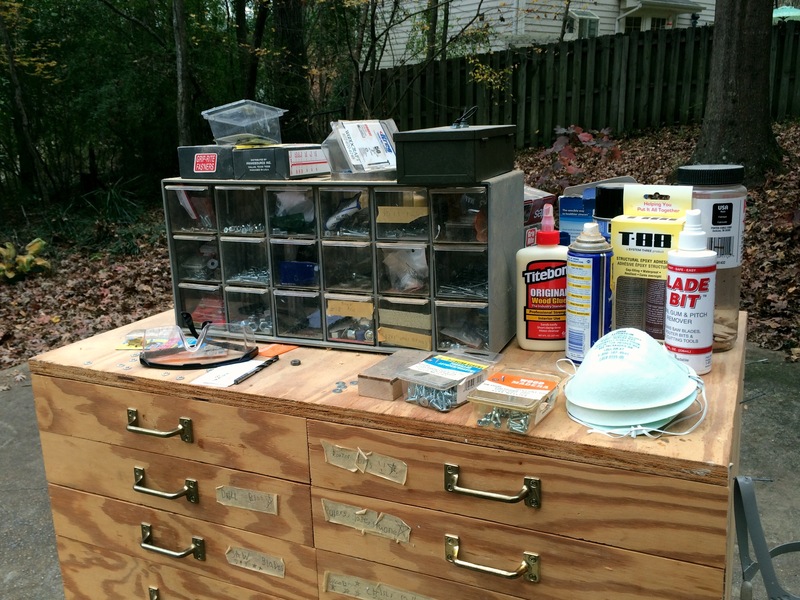 But, the point is that nails and glue have been more than adequate to keep my tool cabinet in service for more than two decades. However, the combination of nails and glue is low tech joinery and I have been in the mood lately to push myself to do new and better things. I got a dovetail saw for Christmas 2014 with the hopes that just having one would spur me on to actually create dovetails by hand. The new tool cabinet case joinery would be the perfect opportunity to attempt dovetails. But; I also want to knock this project out as fast as possible. This new cabinet has 11 drawers to make which takes some time, so I am inclined to use screws for the case (as much as possible actually). Dovetails can wait for a future, smaller project. I plan on using screws and biscuits at each corner and dado joints for the interior case pieces along with a rabbet for the case back. The face frame will be joined with pocket screws and will be attached to the case with pocket screws as well. The drawer joinery will make use of dowels. At least this will be better joinery than the nails and glue used with my old tool cabinet. With the joinery set, there are a few things I need to buy before I can lock down the final design. This cabinet will be removable from the wall unit which will surround it. I have a water heater which resides right next to the new tool cabinet’s home, and I want the ability to roll the tool cabinet out-of-the-way the next time we have a problem with the water heater. So, I need to buy the casters and, I need to buy the drawer slides to ensure I don’t run into any design surprises concerning the drawers. Casters and expensive drawer slides. The drawer slides are the real expensive under mount kind that is totally hidden from view. These are weighty slides and definitely are not typical of what I use. The cost is so much that I decided to buy only two pair. The middle and upper drawers are small enough that I will not use slides at all. The previous face frame design. The current design with some slight alterations. This cabinet has to fit within a specific opening, so I made the decision to draw a full size rendering so I can make sure everything fits. My original design was slightly wide and a little too tall to fit below the sloping stair case. Y’all know I like SketchUp, but there is nothing like a full size drawing to ensure everything is just right. I drew the plywood case in blue Sharpie and the face frame in black (the face frame overlays the case on all four sides). I’ll continue to draw the plywood parts and dado joinery this week and update the SketchUp model. Hopefully, I’ll begin cutting wood next weekend. So, this project is getting exciting and with the purchase of parts, some momentum is underway. looking forward to seeing more on this. Thanks Andrew. Hopefully you will see more next weekend. Finding time will be a challenge, what with Alabama playing in the SEC Championship game. Looks like you are just about ready to bring this thing to reality. I would be lost without a full-scale shop drawing to work from. The full-size drawing has saved my bacon more than once. Excited for you and look forward to watching you bring this one along. The full size drawing has already saved my bacon. I need to also do a side elevation and I am concerned slightly that the casters plastic wheels my compress somewhat from the weight of the cabinet and tools. But, just got to get this thing going. Thanks Manuel. I hope it will be a relatively quick build (at least quick for me). I have had no luck with the casters with the red tires like you are about to use. I have replaced about 30 of them over the last 20 years, getting between 2 to 5 years service before the tires crack and come apart. I have a tool cabinet similar to yours and it gets very tiresome to unload it and change out the casters every few years. The casters on your original cabinet seem to have held up and they look like the type that I have that held up and never failed. Those red casters are my pet peeve. What casters have you had success with? Can you give me a brand?